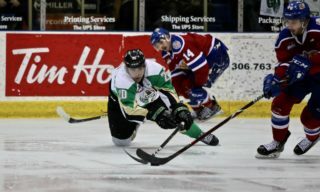 Prince Albert, SK – Brett Leason scored with 2:25 remaining in the third period to give the Prince Albert Raiders (42-7-0-2) a 4-3 win over the Moose Jaw Warriors (28-12-6-2) on Saturday night at the Art Hauser Centre. Leason’s goal was his 32nd of the season and ninth game winner. Cole Fonstad was the only Raider with a multi-point game, registering a goal and an assist in the win. Fonstad got the scoring started for the second consecutive game. 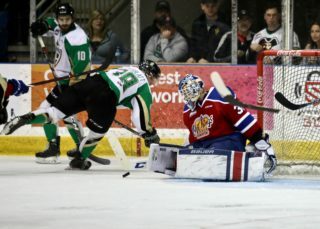 After Dante Hannoun circled the zone and kept the play alive, the overager found Fonstad in the slot and the Montreal Canadiens prospect picked the far corner on Brodan Salmond. The goal was his 21st of the season, tying his career high. Late in the first, the Warriors tied the game on the power play. Josh Brook picked up a puck in the corner off a rebound and threw the puck on goal. The shot went off Ian Scott’s back and in to make it a 1-1 game at the first intermission. The Raiders retook the lead 4:50 into the second. Brayden Pachal’s point shot was redirected by Sean Montgomery, who was getting cross-checked from behind, past Salmond for his 21st of the year. Moose Jaw responded again with another power-play goal. Scott made the initial save, but the rebound found the stick of Brayden Tracey. The Warriors rookie deposited the rebound for his 23rd goal of the season. Less than a minute later, the Raiders regained their lead. Kaiden Guhle’s slapshot from the point got past Salmond to put the Raiders up 3-2 with 3:56 left in the second. The shot may have hit Justin Nachbaur, who was providing a screen, on the top of the crease. That lead held until late in the third period. After the Raiders killed the first penalty of a five-on-three, a blocked pass found the stick of Justin Almeida. The Pittsburgh Penguins prospect snapped a shot past Scott with seven seconds left on the power play. That set the stage for Leason’s winner. 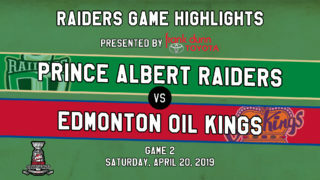 Gregor hit Leason with a pass from behind the net and the Raiders leading scorer snuck a shot through Salmond’s arm to put the Raiders ahead for good. Scott finished the game with 28 saves in his 29th win of the year. 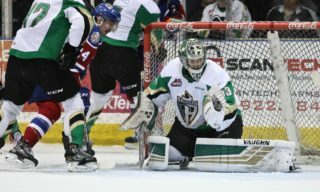 Salmond stopped 31 shots in the loss. 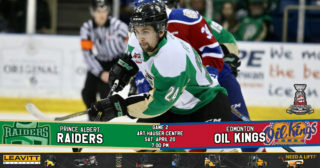 The Raiders hit the road for three games beginning on Monday night in Edmonton against the Oil Kings (29-15-4-4) at Rogers Place. Game time is 8 p.m.